La Permanence has a dream of becoming the open-air museum of cycling. LaP is the interactive tour guide for amateur cyclists and guides them to unique spots wherever they go. LaP has an in-depth understanding of cycling culture and the product they have in mind enriches the sport. Fan Arena offers the technology to take engagement to the next level. LOOKING FOR SOME HOT CYCLING SPOTS? 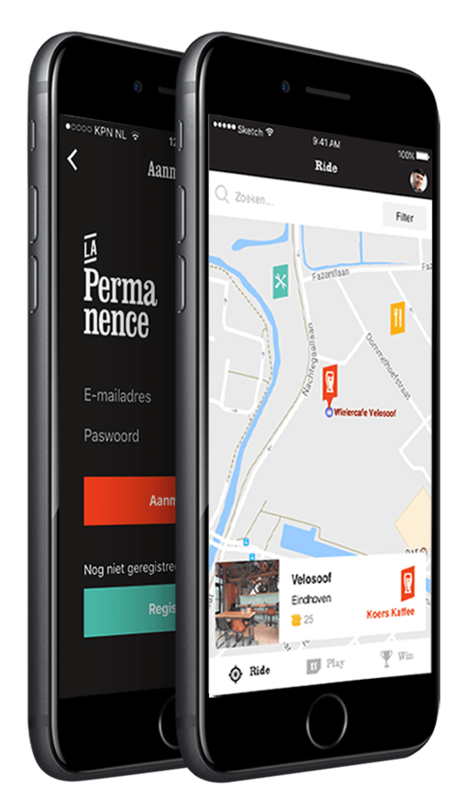 Cycling fans can check in and discover La Permanence cycling spots at home and abroad. The app allows you to collect loyalty points which can be redeemed in a webshop with cycling products. “Their biggest challenge was to connect different areas like geolocation, gamification and rewards together to engage the cyclist lover on- and offline. Our component-based approached helped quickly deliver a product that would check all boxes.”, says Octavian from Fan Arena. I really like working together with a company like Fan Arena. The know all about the latest technologies, short lines of communication and they are true sports fans. We're certainly not finished with these guys! A day in the life of a La Permanence. Plan a route and discover new climbs, stop at a bike shop when in need of repairs and refuel at bars and brasseries with your mates.